Best Credit Score - Top 10 States where your state ranks based on? Lenders look at credit scores as a way to gauge a person’s creditworthiness. In today’s recessive economy, it might seem like everyone is taking a hit to that all important credit score. It will probably come as a surprise to you that some states are faring better than others. Living in a particular locale doesn’t mean you have perfect credit, however. Knowing which states top the list will give you an idea of how you compare with the people living around you. What Factors Influence a State’s Average Credit Rating? Warm-weather locations tend to suffer more than states that face the cold each year, too. This may be in part due to their tourism-based economies. As a nation, Vantage Scores average from 707 to 785, but by state, there is a wider distribution. 10. Iowa – With a score that sits around 771, Iowa makes the top 10. Residents of Iowa tend to have low credit card delinquencies, and the state as a whole has low unemployment. Iowa does take a mild ding for a higher-than-average foreclosure rate. It was enough to push the state down to number 10. 9. Hawaii – Hawaii is tied with Connecticut and Wisconsin for average credit score, with all three coming in at 772. Hawaii is the exception to the warm weather rule. While this sunshine state is known for its high cost of living, it also hosts one of the highest number of millionaires per capita in the U.S.
8. Wisconsin – Coming in at 772, Wisconsin boasts a gross state product of $248.3 billion. A negative factor in its credit score is high unemployment. The Bureau of Labor Statistics reports the rate in Wisconsin hovers around 6.3, but that is a considerable improvement over the 2010 numbers. 7. Connecticut – The per capita income in the state of Connecticut is one of the best in the country, but the unemployment rate runs high. In this case, the one positive and one negative cancel each other out to give the state an average credit rating of 772. 6. Massachusetts – With a rate of 773, Massachusetts is number six on the top 10 list. Like Connecticut, Massachusetts gains points based on its high personal income – it is the third-richest state in the union. It is also home to 13 Fortune 500 companies, making it one of CNBC’s top states for business in 2010. 5. 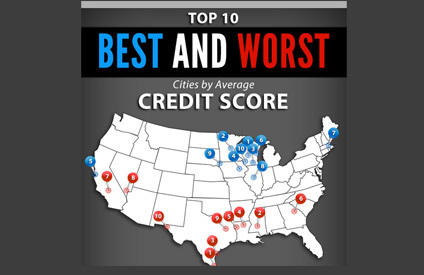 North Dakota – Back in 2011, this was the state that topped the list of best credit scores. Today, it is still one of the top contenders based on all the credit metrics. North Dakota reports the lowest unemployment rate in the country – just 2.7 percent – and maintains low credit card delinquencies, giving it an overall credit score of 775. 4. New Hampshire – Tied with North Dakota is New Hampshire. Like its New England neighbors, New Hampshire gains points for high personal income. It ranks number seven in the country. Unlike Connecticut and Massachusetts, it has a reasonable unemployment rate, too – well below the national average. 3. Vermont – The state of Vermont ties with South Dakota for slots two and three. Vermont has steadily maintained low foreclosure rates. The nationwide proportion of foreclosures is around one in every 2,370 housing units. In Vermont, that number is closer to one in every 39,000 units. Vermont ranks high in almost every measurable category, giving it an average credit score of 777. 2. South Dakota – Another state that makes the list year after year, South Dakota also boasts an average credit score of 777. The state maintains a low unemployment rate, tied with Nebraska at 3.6. It also makes the top six for high scores in all measurable categories. 1. Minnesota – Topping the list at the end of 2013 was Minnesota. The residents of this state have some of the highest credit ratings in the nation. Combined, their average puts Minnesota in the lead with a score of 785. Credit scores change year to year for each state. In 2011, North Dakota was at the top of the heap, followed closely by Vermont, South Dakota and Nebraska. In 2013, Nebraska didn’t even make the cut, due in part to a high rate of bankruptcies. Moving to another location is probably not the answer to a low personal credit score, but knowing your state average does provide perspective. Once your score drops, it takes work to build it up again. The key to improving faltering credit is a comprehensive credit repair program. It starts with a review of your payment history and putting FCRA and FACTA laws to work for you, so you can build better credit opportunities no matter where you live.